Here is a fascinating place - a huge defensive castle in the Zghorta district of North Lebanon.Built in 1816 by Mustafa Agha Barbar, Governor of Tripoli, it sits on a high hill overlooking a wide panoramic view. Mustafa Barbar Agha was appointed Governor of Tripoli by the Ottomans in 1798. He built his castle here because of the strategic location and perhaps also because of the sense of calm and security it provided. Even today from this hilltop visitors can look down on olive orchards, wild gardens, and a clear view of Tripoli and the coast. You arrive at the castle by taking a wide set of grassy steps which bring you to a front entrance guarded by a huge wooden door covered with metal studs. Within the 5 000 square meters of the castle walls are stables, wells, sleeping quarters and reservoirs. The large court has a central basin called "birket as-sbaa" or " basin of the lions", named for the lions carved on the stone. Look for the small rooms around the courtyard which served as bathrooms in the old days. 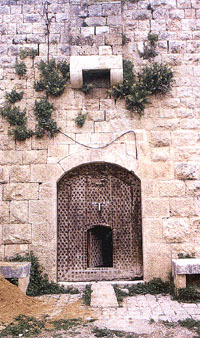 A narrow stone staircase leads to a serail, where the governor had his office. Nearby were the women's rooms. Unfortunately the castle has lost most of its roof, except for the section where some of Mustafa Barbar Agha's modern descendants are now living. Behind the fortress a small graveyard holds the marble tombs of Mustafa Barbar Agha and his family. There is also a mosque and some old barracks in this part of the castle grounds. You can reach the I'aal castle by going through Zghorta and turning left towards the town of Kalldeye. I'aal village, with its population of about 1 000 people, is only six km from Zghorta. Copyright� 1995-2001 Lebanon.Com Interactive. All Rights Reserved.